My running route from last night: Fleet Feet Piper's Alley to Lincoln Park to the boat at North Avenue Beach to the John Hancock Center to the Museum of Contemporary Art to The W Hotel. Why all of the stops? 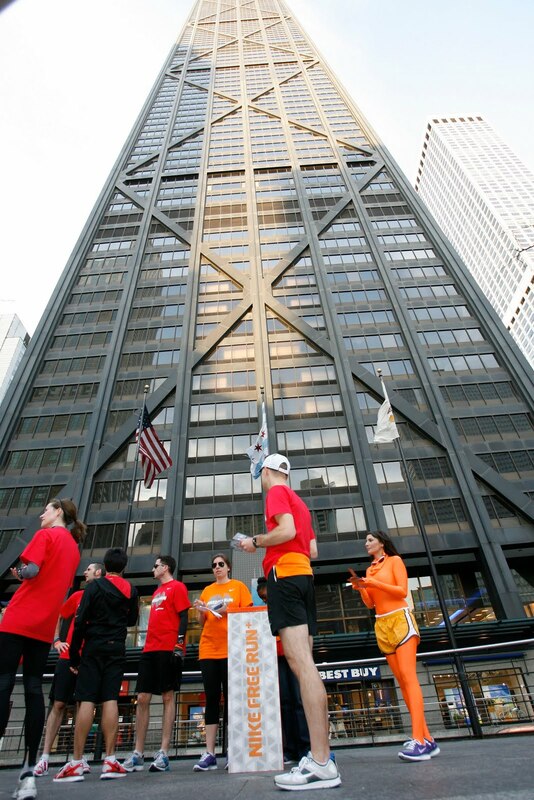 That was part of the fun of the Freedom Run hosted by Nike and Fleet Feet Chicago that sent runners off on a scavenger hunt around the city and ended at a surprise location. Again, like the last Nike run, I arrived at the store not knowing what to expect. I was running a little late--my legs didn't follow my plan to run from house to store and would only trot for their first run post-Boston--but managed to arrive before we departed. Upon entering we were given a shirt--one from a rainbow of colors--and told to find our team color in the gathering space. First it looked like I'd be sporting a purple tee, then pink, but the volunteer settled on teal--the color I was leaning toward anyway when I couldn't sport purple pride (Go NU!). And if you arrived earlier, you could trial the new Nike Free Run+ and see what the new technology was all about. To the back I went, sliding in among the colors--teal, blue, purple, pink, orange and red--to listen to our final instructions. 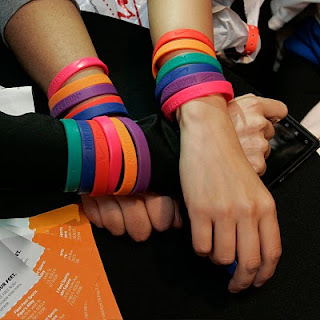 Stay with your color, run together, grab a bracelet at each stop. Teal started first and we were to go outside the door to get our clue (free-themed, of course) for the next location. And a timer on each team would be tracking how long it takes to complete. Got it. Only problem was my brain wasn't entirely turned on last night. A few years back I prided myself on my knowledge of random trivia and ability to crush many competitors in a game of Trivial Pursuit, but if I was trying to answer those questions last night--especially anything about Chicago--I would have failed miserably. And I should have kept my answers to myself rather than quietly try to make friends with someone on my team--yep I was the lone wolf once again when friends had other commitments--by blurting out the wrong answer, thinking that we'd be running far more than the organizers every dreamed at this fun event. First clue: Find Mr. Blue. This U.S. President's personal wish was that all men be FREE. Not only did they name the park after him, they erected a monument too. Stupid thought No. 1: I'm thinking Lincoln Park but can only remember the Grant statue near the zoo which leads me to think we'll be sprinting south to Grant Park. Duh: Abraham Lincoln was behind the Emancipation Proclamation, not Ulysses S. Grant. We grabbed our teal/green bracelets and took over toward the southern end of Lincoln Park where the smart people in my group knew of the Lincoln Statue. I've lived downtown for seven years and I swear that was the first time I noticed it--oops. But with Mr. Blue--complete with a navy blue spandex suit zipped completely over his head--and crew standing on the steps and sirens blaring, Lincoln was hard to miss. We collected our blue bracelets and clues, contemplating our next move and catching our breath. Second clue: Find Mr. Red. The beach is FREE, maybe that's why this boat's not going anywhere. On a nice summer day, this is a great place to enjoy cocktails on the beach. Take the high road to bridge the gap between park and beach. We hauled across the path winding north through Lincoln Park and over to the bridge that spans Lake Shore Drive to reach the beach and then we booked it to the next station outside the big boat that holds Castaways at North Avenue Beach. 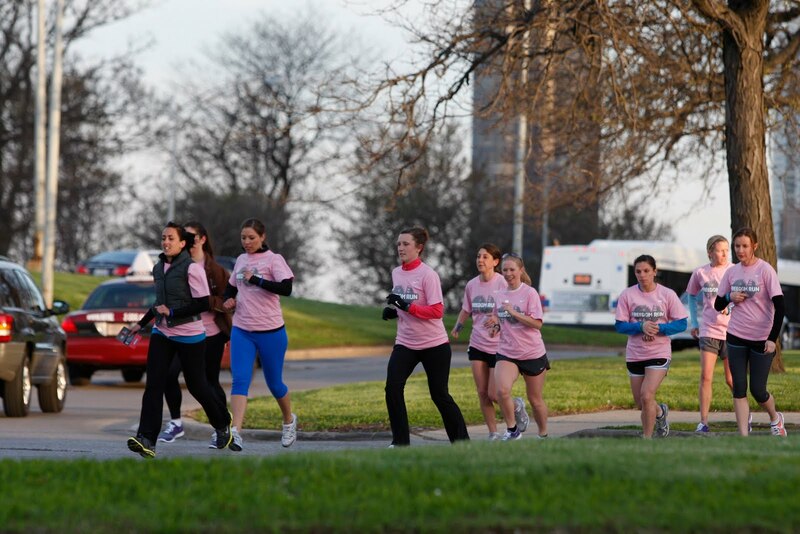 With mixed speeds among the group, some would arrive first and then cheer on the others as they finished. But the amazing part was we weren't so far apart that you felt held up by people in the group. Good deal, and onto the next clue. Stupid thought No. 2: Are we going to run up to the top of the Hancock? Yep, the thought crossed my mind even though it would be a pretty crazy challenge to conquer on top of all the running. But that was just a case of me not reading the clue entirely. The minute our group reconvened at the boathouse, part of the group took off toward Oak Street Beach. I settled in with a runner who's running the Kenosha Half Marathon this weekend while her husband runs the full. And she claimed that she couldn't even run a mile when she started running last May--wow! But we were both thankful to see the next outpost outside the John Hancock Center after sprinting a little too hard down that beach stretch. Fourth clue: Find Mrs. Purple. If the NEW Nike Free Run+ were Art you would find them here in all their colors, only works from 1945 to present are included. If it were Tuesday admission would be FREE. Stupid thought No. 3: Art and after 1945 made me think Modern Wing at the Art Institute before considering the Museum of Contemporary Art. 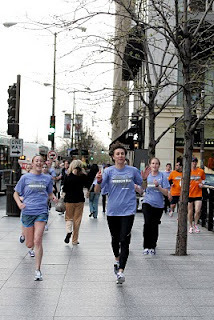 Again, that's me turning the fun run into an epic trek, all while wondering how our group would navigate through the pedestrian traffic on Michigan Avenue to reach it. But alas, we only had to go around the corner to the museum that still offers free Tuesdays. After what felt like a sprint between North Avenue Beach and the Hancock, I welcomed the break while we waited for the rest of the group to join us. And rather than take off right away, someone decided to hold back and have everyone run to the purple stop together. I don't think the cars driving behind Water Tower Place were too pleased with our running, but they were at least nice enough to let us all stream by as we disobeyed the crosswalk signals. 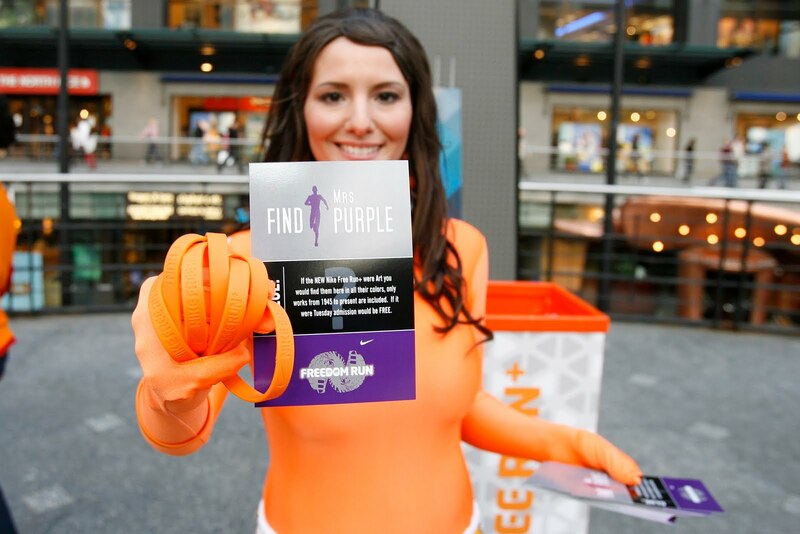 It's tough to stop when you can see Mrs. Purple standing across the street and you just want to get there and move on to the next clue. Fifth--and last--clue: Find Mr. Pink. It's the last stop on the Freedom Run and it's almost the last letter in the alphabet. A FREE surprise awaits you, hope you don't mind the Altitude at this hip hotel on Lakeshore. No stupid thoughts here. I read hotel and Lakeshore and knew right away that meant the W. Sure it was process of elimination and the fact that there aren't other hotels right on the drive but at least I didn't open my mouth and give a dumb answer. We sprinted down the inner portion of Lake Shore Drive and saw Mr. Pink waiting for us. Yay, we made it! By that point my heart was racing, sweat was dripping and I could even feel a little yank on my hamstring--reminding me I was supposed to take it easy tonight. Mr. Pink instructed us to enter the building and head to the 33rd floor--the site of Altitude, our final destination and post-run party. A great gathering area to cool down with friends--or meet a few peeps if you alone like me--filled with as many beverages and hors d'oeuvres as you could handle, and a check out the new shoes. Turns out I ran with two people I sort of knew too--Julie Hammer, marketing director at Time Out Chicago, who blogged about her Boston Marathon experience at The Rundown, and a girl who I biked next to at Taste of VQ last April. After mingling a while, the explanation came as to why we had a timer with us: to see how the teams stacked up speed-wise with the staggered start. Pink finished third, purple finished second, and taking home the gold was...TEAL! Somehow we managed to finish roughly five minutes ahead of the other teams, which meant we had the honor of standing in front of the crowd to receive medals around our necks as We Are the Champions played in the background. Now I know what the celebs must feel like when the paparazzi come around--the photogs surrounded us to capture images from the event. Was it worth it? Absolutely. And I'm not just saying that because I got to visit my husband--who couldn't attend because he was working--on my jog home. And brag to my friend--who said he'd prefer to know where and how far he was running--about the fun I had. The teal team's medal-winning performance was pretty cool, too. 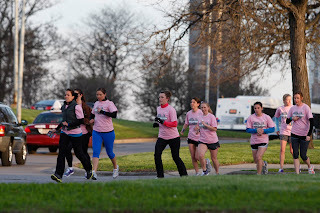 Check out images from last night at Fleet Feet's Facebook page. Photos courtesy of Nike. I like this website. This website helped me with prayer learning.and welcome to visit our website nike outlet stores.thank you!